Wasps are not the kind of neighbors you want to find setting up home right next to your house. Wasps won’t actively target humans or pets, but accidents do happen, and stings can be extremely painful. If you have a severe allergy to wasp venom, a sting can even land you in hospital. In this Buyer’s Guide, we’ve reviewed five of the very best wasp spray products that are currently available to buy online. You’ll also find lots of helpful information to help you win the war against the black and yellow peril! We’ve included only the most popular and effective wasp sprays you can buy in this section of our Guide. Click on the links to read full details of each product, including other users’ reviews. When you’ve found the perfect wasp spray for your needs, click to place your order. This product is powerful enough to take out the largest wasp or hornet nest, immediately killing the insects. The clue to how the spray works is in the name; it freezes the wasps on contact, allowing you to knock down the nest without getting stung. The active ingredients contained in the product are allethrin and phenothrin, both highly effective insecticides. The product is highly effective, freezing the whole wasp nest from the outside. You don’t have to get too close to the nest to use the spray; it can be deployed from up to 20 feet away. The spray can kill plants and stain clothing, so be careful to cover your clothes and any vulnerable garden plants before using the product. Hot Shot is one of the most popular wasp killing spray products on the market. It’s very effective, despite being more affordable than many other comparable products. The spray works by creating a durable foam that kills wasps, yellow jackets, and hornets on contact. You can deploy the spray from up to 27 feet away from the nest, avoiding the risk of getting too close. The product is highly effective and can kill the whole colony. You don’t need to get too close to the nest, as the spray can be deployed from up to 27 feet away. The product is ready to use, so you don’t need to mix it with water first. Some users report that the spray doesn’t always eliminate every last wasp in the colony. 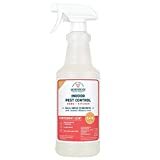 If you’re looking for an all-natural wasp spray that’s safe to use around pets and children, Wondercide is the way to go. You can safely use the spray anywhere inside and outside your home because it doesn’t contain toxic chemicals or leave nasty stains behind. You can spray the product directly onto your skin as an insect repellent, and it works on over 100 species of insects, including wasps and hornets. The spray contains lemongrass and peppermint oil, so it smells great in addition to working well to repel wasps. The ingredients are all-natural, so there are no toxic chemicals in the spray that could harm pets or children. The smell can be a little overpowering. The spray doesn’t kill the wasps; it only repels them. However, it’s handy for keeping the buzzing menaces away during mealtimes or outdoor parties. 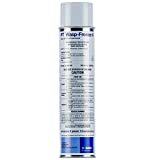 Viper Insect Concentrate works well and is easy to use, although you do have to mix it yourself. The active ingredient contained in the spray is cypermethrin, a potent insecticide that kills insects quickly. In small doses, the spray is safe to use around kids and pets. Once you’ve mixed the spray, you will need to buy an attachment to deploy it. The Chapin 2-gallon sprayer is perfect for this job, and we highly recommend it. The active ingredient, cypermethrin, is derived from natural ingredients, so you can safely use the spray around kids and pets. The spray is affordable and efficient, killing wasps, hornets, and other winged pests quickly. You need to buy a separate sprayer attachment to deploy the product. However, once you’ve bought the sprayer, it’s there for use whenever you need it. 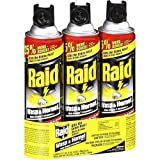 Raid is one of the most well-known and popular brands when it comes to insecticides and pest killers. Their wasp and hornet spray can be used to kill pests from 22 feet away and kills on contact. Also, the product will continue working after the initial delivery, so you know the wasps will die, even if they initially make a break for it! The spray comes in a ready-to-use aerosol can and as a pack of three, making this a very cost-effective product to choose, particularly as it works on other insect pests too. Kills on contact from up to 22' away - No need to "spray and sprint"! The product can be used from a safe distance of up to 22 feet. You don’t need to buy additional attachments. The spray is ready-mixed, so you don’t have the hassle of having to prepare the product yourself. The three-pack is very economical, as the spray works on other insect pests as well as wasps and hornets. The product can’t be used to kill a whole wasp nest, although it’s fine for dispatching individual problem insects inside your home. Contrary to popular belief, not every insect clad in black and yellow is a wasp. Some black and yellow insects are completely harmless, such as the hoverfly whose innocent aim is to pollinate the flowers in your garden and patio tubs. The yellowjacket, on the other hand is another matter. Yellowjackets are a species of wasp that will sting if aggravated. Then there are hornets. There are many different species of hornet, some being relatively harmless, and others decidedly aggressive and very dangerous. If you discover a nest on your property and you’re not sure who lives there, contact a professional pest control company for advice before attempting to tackle the colony by yourself. All the products we’ve reviewed in this guide will kill wasps. But what can you do to keep wasps away from your property in the first place? Wasps come into your home or invade your patio party because something you have is attracting them. Wasps love anything sugary, so if you’re drinking soda or eating fruit and sticky cakes, you can expect a flying raiding party to gatecrash your soiree. You can use the wasps’ penchant for sweet things to your advantage by placing a sugar and water solution in a container and siting it far away from your living and socializing areas. That way, you and the wasps can live in harmony without anyone getting stung. What about the wasp nest? Sometimes wasps build their nests in places where you definitely don’t want them. For example, in your garden shed, in your garage, under the eaves of your house next to a window, or beneath wooden garden decking. If the proximity of the nest to your home presents a danger to you and your family, it’s best to get rid of the colony. If the wasp nest is in a spot where it’s difficult and potentially dangerous to tackle it yourself, or if it’s a vast colony full of aggressive wasps, don’t risk it; call in a professional pest controller. However, small nests can usually be dealt with safely. It’s sensible to buy some eye protection and thick gloves too in case things go wrong. Also, you will also need a headlamp with a red filter option; wasps cannot see the red light so will not be attracted to the light’s beam. If the wasp nest is in a site that’s up high, don’t try to tackle it from a ladder. If you do get stung, there’s a risk that you could fall. Instead, invest in a 30-foot wasp pole (we like this one). That’s a specially designed extending pole that allows you to spray insecticide from up to 30 feet away. Wait until the sun has gone down and all the wasps are safely back inside the nest. Put on your eye protection, gloves, a long-sleeved shirt, trousers, socks, and boots; this will protect you from any wasps that might come out of the nest when disturbed. When you examine the nest, you’ll see one entrance hole, usually situated at the bottom of the sphere. Aim the nozzle on your wasp killer spray right up into the hole, and give it several good pumps to infiltrate the nest fully.Don’t hang around to see what happens! Leave the area immediately and shut the door behind you if the nest is inside a building. The following morning, check the nest for signs of activity; all should be quiet with no sounds of buzzing from within and no wasps flying around nearby. Leave the nest in place for a few weeks before removing it by knocking it down with a stick into a bucket and then burning it. Is wasp spray safe to use around people and pets? Now you’ve chosen a wasp spray; you’ll want to know how safe it is to use around your family and pets. Most wasp sprays that are designed for domestic use are safe to use in your home. That said, many do contain toxic chemicals and should be used with care. Be sure to read all the manufacturer’s instructions; not all wasp sprays are the same. Wear thick rubber gloves to protect your hands. Wear eye protection if you’re using the spray outdoors and there’s a risk of the wind blowing the chemicals back into your face. Do not get the chemical on your skin. If the spray requires mixing before use, take care not to touch the pure, unmixed chemical. If you’re using the wasp spray outside, try to pick a day when it’s not windy. In case you do accidentally inhale a mouthful of spray, get into the fresh air as quickly as possible. Loosen any tight clothing around your neck so that nothing is hindering your breathing or obstructing airflow to your lungs. If you experience severe breathing problems, call an ambulance. Tell the dispatcher what the product is that you’ve inhaled. If you get some spray in your eyes, wash your eyes under clean water immediately. Tilt your head to one side, and allow the water to flow gently across your eye. Although a splash of domestic-use wasp spray in your eye will be extremely painful, it won’t cause permanent damage. However, if symptoms persist, contact your doctor for advice. This section of our Guide provides you with answers to some of the questions that are commonly asked about wasps and how to deal with them. If you don’t see the information you’re looking for, drop us an email, and we’ll try our best to help you out! Q: How long does it take for a wasp nest to die? A: Typically, it takes between two and 24 hours for a wasp nest to die off completely after you’ve sprayed it, depending on the species of wasp, the spray you used, and the size of the nest. Q: Will cold weather kill a wasp nest? A: Not necessarily. Queen wasps are resistant to very cold weather and frost once they’re hibernating. Cold weather merely tends to slow wasps down and can even extend their lifespan. Wasp colonies die off during the winter through starvation, not because of the cold. Q: Do wasps sleep at night? A: No. Wasps don’t sleep. However, they don’t fly after dark, which is why night time is the best time to tackle a nest. Be careful though; hornets do fly outside at night time. That’s why you must be sure who’s living in the nest before you try to take it down. Q: Do wasps attack you without provocation? A: Unprovoked wasp attacks are very rare. Wasps usually only sting to subdue their insect prey or to defend themselves or their colony. Q: Can wasps smell your fear? A: Wasps are usually attracted by the smell of your food, not your fear of them! But you should know that distressing a wasp is potentially asking for trouble as they give off pheromones that will bring their nest-mates in numbers, rushing to their aid. If wasps are bothering you by invading your home and outside space, or if there’s a wasp nest in a place that presents a danger to your family or your pets, you can use a good wasp spray such as those we’ve reviewed to deal with the problem. We especially like Pt Wasp Freeze II Aerosol if you have a wasp nest to tackle. The spray works by killing the wasps on contact and is powerful enough to take down a whole colony. Also, you can use the spray from up to 20 feet away, so you don’t have to get too close to the wasps.